The Yale EasyFit Alarm kit systems are designed with the user in mind, years of experience and customer feedback has allowed the Yale customer team and design engineers to simplify the entire set up, yet at the same time increasing the levels of security and reliability. This Yale EF-KIT3 Easy Fit Smartphone Kit takes just a few minutes to program and set up, after which it is really simple to use, even though the alarm system does have a number of high level, professional security features. The easy installation process and Wi-Fi capability means there is no need for wiring into mains power and the services of a qualified electrician are not required. Plus there is no need for redecoration as you do not have to run cables to all the sensors. All the various component parts and sensors are self-contained and there are no wired connections required between the devices. The system is modular so it is easy to add additional door or window contacts, PIR’s, keyfob controls, keypads and smoke detectors to the systems. This Smartphone alarm is Yale’s top of the range home system as it can be operated using your own smartphone or computer via a standard web browser. When the alarm is triggered, the infra-red camera can take a high resolution image of the room and send it direct to your phone by email and push notification. You can also upgrade this security and camera system with clever power switch accessories which allow you to control lights, appliances and other electrical items in your home. 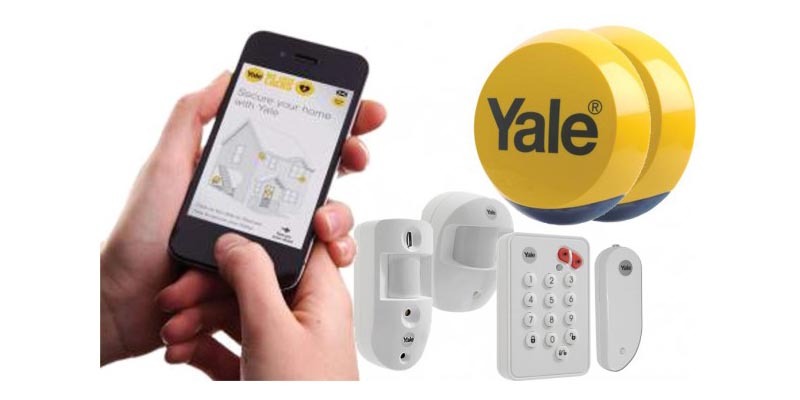 The smartphone version of the Yale EF-KIT3 Easy Fit Alarm Kit contains a control box, PIR, camera PIR, door contact, external siren box, dummy siren box and keypad.